Pick Analysis: This tall, lean receiver presents problems for defenses on short, intermediate, and deep routes. The two-time first-team All-MAC pick caught 85 passes for 1,281 yards and seven touchdowns in his junior year, setting up big expectations for 2015. He exceeded those expectations, winning second team All-American honors from the Walter Camp Foundation by leading the nation with 9.3 receptions per game (total of 111) and ranking sixth in yards per game (109.9-yard average). Sharpe also finished his career catching a pass in every game he played for the Minutemen. 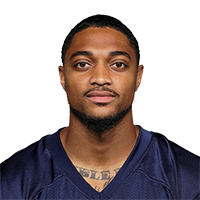 Published: March 12, 2016 at 05:13 p.m.
Watch Massachusetts wide receiver Tajae Sharpe work out at the 2016 NFL Scouting Combine.